Pramana Collective hires Brendan Lewis; Clinton campaign locks out 'Daily Mail' reporter; Jeb Bush kicks off campaign in English and Spanish. 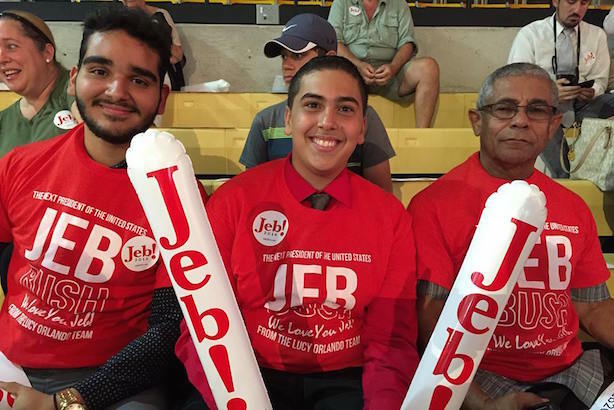 Supporters of Jeb Bush at his campaign kickoff on Monday. (Image via the campaign's Facebook page). 1. The Pramana Collective has hired Brendan Lewis, who has led communications at Shazam and Foursquare, to build out its footprint in New York City. He’ll start in the coming weeks. Principal Eitan Bencuya is leaving the firm. 2. Hillary Clinton’s campaign banned a reporter from the Daily Mail and a member of the national print pool, from covering her Monday event in New Hampshire in the latest spat between her camp and the media. The campaign said it has been getting blowback from other foreign outlets and needs to rethink its strategy for dealing with them. 3. The Nobel Peace Center is cutting ties with FIFA, which is mired in corruption scandal and facing investigations by US and Swiss authorities. The organization runs the Norway museum associated with the Nobel Peace Prize and its winners. 4. Jeb Bush kicked off his campaign for president on Monday, appealing to Hispanic voters by addressing the crowd in Miami in Spanish as well as English. After being confronted by a heckler, the former Florida governor promised the next president will pass comprehensive immigration reform. 5. Apple News, the app unveiled last week at the company’s Worldwide Developer Conference, will have a human touch, according to a job ad for the platform. The company is looking to set up a team of editors to curate news via the app. 6. Pope Francis is set to take on climate change in his latest encyclical letter, according to leaked drafts. The pontiff will reportedly say climate change is mostly man-made and will encourage the church to listen to scientists. 7. United Airlines has apologized to customers who were forced to spend the night in a Canadian military barracks after a flight from Chicago to London was grounded due to maintenance issues. It also gave them their money back. 8. Rachel Dolezal has stepped down as the leader of the Spokane, Washington, NAACP, after facing accusations that she faked her race to appear African-American. She’s also being criticized for not apologizing in her statement on the incident. 9. Sen. Mark Kirk (R-IL) apologized on Monday evening for referring to bachelor Republican presidential candidate Senator Lindsey Graham as "a bro with no ho." He issued the mea culpa four days after making the remarks.